Provincial Government of Sindh and Pakistan Rangers (Sindh): A Frayed Relation falling prey to a continuous Trust Deficit? Provincial Government of Sindh and Pakistan Rangers (Sindh): A Frayed relationship falling prey to a continuous Trust Deficit? Amidst a change of leadership in the Provincial Government of Sindh, the month of July 2016 was again marked by the continuing trust deficit that has come to beset an increasingly frayed relation between the Sindh Government and the Pakistan Rangers (Sindh). Every single time the matter of Pakistan Rangers’ (Sindh) extension in Sindh rears itself, it falls prey to some form of friction between the Federal Government, the Provincial Government and the paramilitary force. The Rangers’ Special Policing Powers1 for the Karachi Division were last notified by the Federal Ministry of Interior on May 09, 2016 for 77 days, a period which ended on July 19, 2016.2 On the other hand, the Rangers’ deployment in Sindh was last notified by the Federal Ministry for Interior,3 on July 30, 2015 for a period of one year, which expired on June 31, 2016. However, the Provincial Government of Sindh delayed requesting the Federal Government for an extension in the deployment and special policing powers of the Rangers yet again. Given that the final notification was issued by the Federal Ministry of Interior extending the special policing powers of the Rangers for a period of 90 days in Karachi, and with regards to their deployment in Sindh for one whole year on August 03, 2016, with effect from July 20, 2016, the Rangers were de-facto operating without a legal cover for approximately two weeks. We believe that the dynamics of the Karachi Operation, and the recurrent friction that is observed can practically be reduced to two major considerations: The Provincial Government of Sindh apparently believes that the Pakistan Rangers (Sindh) is effectively acting as an entity independent of the Provincial Government, often in violation of the constitutional and legal dictates, although it has been requisitioned in aid of civil power under Article 147 of the Constitution.4 The Pakistan Rangers (Sindh) on the other hand apparently believe that there persists a strong nexus between the political, criminal and terrorist activities, particularly in Karachi, and generally in Sindh, which has led to the precarious law and order situation. A cursory analysis makes obvious that there is some weight behind both these considerations, which mutually contribute to the crippling trust deficit. Although the Provincial Government seemed to be on board with the Operation launched in September 2013 by the PML-N led Federal Government, it chose to draw the proverbial line in the sand with the raid by the Rangers on the Sindh Building Control Authority (SBCA) and the Lines Area Development Project (LADP) in June 2015, iterating that the paramilitary force had started ‘to act beyond its authority and mandate’.5 Subsequently, the arrests of senior PPP leaders such as Dr. Asim Hussain further increased the atmosphere of distrust. 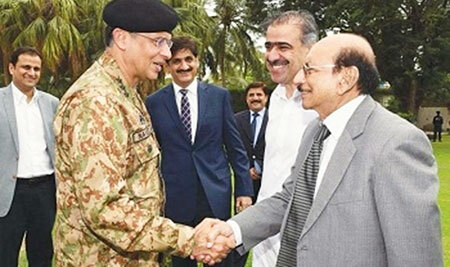 However, the underlying issue seems to be that the Pakistan Rangers (Sindh) have apparently extended their operations to other parts of Sindh too, whereas their special policing powers are only for Karachi.10 In fact, this also emanated as an official demand on part of the Director General of the Pakistan Rangers (Sindh) Maj. Gen. Bilal Akbar, who stated that ‘peace is not possible without an action in other cities of Sindh… we are considering it as per the law’.11 However, the PPP leadership has desisted from accepting this demand, as reflected in the notification issued on August 03, 2016, maintaining that there is no need to extend the special policing powers to the rest of the province, since the Rangers are free to carry out raids, however, in accompaniment of the police. Given that friction between the Rangers and the Provincial Government of Sindh persists, and has often spilled out into the media, is there any consultation and dispute resolution taking place at all in the Apex Committee of Sindh? The Federal Government, instead of playing a mediatory role, is resorting to confrontational politics through the Ministry of Interior which seems to have further antagonized the Provincial Government of Sindh. The result is a never-ending media circus with all the stakeholders, including the Provincial Government, the Federal Government and the Rangers, communicating and advocating their viewpoint through the media, rather than through official channels, making the critical Karachi Operation even more hostage to turf wars than a consensus on its effectiveness. Despite all, it was apparently a worth banner-splashing issue, at least in the views of the little known political party or group called Move On Pakistan as it put up banners across 13 major cities of Pakistan on July 10, 2016, stating ‘Janay ki batain hui purani…. Khuda kay liay, ab ajao!’ (Translation: The chatter regarding going is old now-For God’s sake, please come now!). The party had catapulted into national fame, or notoriety, when it put up a series of banners across Islamabad stating that ‘Khuda kay liay…. Janay ki batain janay do!’ (Translation: For God’s sake-Don’t talk about going) following the COAS’ public announcement that speculations about an extension in his service are baseless. 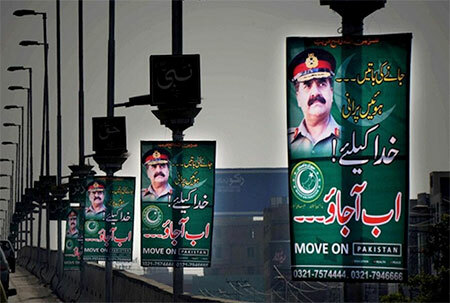 Banners put up by the political party called Move On Pakistan across 13 major cities of Pakistan on July 10, 2016, stating ‘Janay ki batain hui purani…. Khuda kay liay, ab ajao!’ (Translation: The chatter regarding going is old now-For God’s sake, please come now!). Term extensions are essentially a bad trend. These do not just run contrary to an established system, but also convey to the outside world that the institution and its systems are unable to continue to perform effectively without certain individuals, thus demoralizing the very institution. Pakistan Army, as indeed other Military Institutes, is well-known and nationally and internationally admired and credited for well-functioning and effective system displaying continued excellence and internal discipline. Therefore, come November, the Prime Minister, as per the Constitution, should appoint a new Chief of Army Staff, and as expected of his office, should do so on strictly objective considerations. 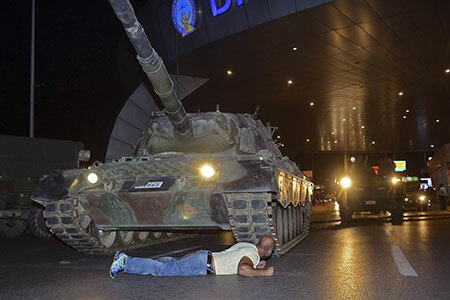 A man in Istanbul lies down in front of a tank being commanded by the section of the Turkish Armed Forces, which had instituted the failed coup attempt on July 15, 2016 in Turkey. Many such acts of bravery have come to mark the Turkish people’s resistance to the coup attempt. Much is known by now of the failed coup d’état attempt of July 15 in Turkey against the AKP-led Government. That the attempt was carried out by a faction within the Turkish Armed Forces, and not of the entire Military, led to, in part, and gratefully for that, its failure. But most heroic, exemplary and most auspicious for a democratic Turkey has been the power of the people in Turkey that stopped the onslaught of the coup by their struggle in the streets of Turkey against it which also resulted in the loss of over 300 precious lives. President Erdogan and the Turkish Government have accused the coup leaders of being linked to the Gülen movement—a group now designated as a terrorist organization by the Turkish Government. The AKP-led Government has also subsequently asked the United States to extradite Mr. Muhammed Fethullah Gülen, 75, to Turkey, although Mr. Gülen has denied all charges of being involved with the coup attempt. In the aftermath of the coup attempt, Turkey has seen that as the resistance against the coup was unprecedented, so has been the massive purge undertaken by President Erdogan subsequently.